At this time of year we are thinking of Christmas and what better way to enjoy your turkey dinner than by adding a spoonful of homemade cranberry sauce. Or how about welcoming family and friends with a real treat of cranberry muffins and cranberry shortbread. The Irish Peatland Conservation Council want you to get cooking this Christmas and enjoy the festive cranberries from the bog. 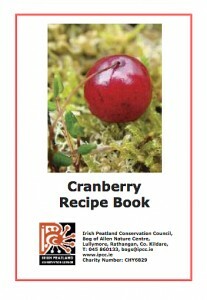 You can download recipes for making cranberry sauce, muffins and shortbread from this link Cranberry Recipe Book or you can contact the IPCC at the Bog of Allen Nature Centre on 045-860133 and we would be happy to send you the cranberry recipes by post. When people think of a bog they often think of turf. However bogs have many other uses that make them important. They are a source of food (see Editors note 1). At this time of year the bright red berry of the cranberry is ripe for harvest. America and Canada are the largest producers of cranberries in the world however many people forget that cranberries are one of Ireland’s wild berries that can be found growing on bogs. During the summer you can identify cranberries on the bog by their bright pink flower and small evergreen leaves on a low creeping stem or vine. The berries of cranberry are initially white and then ripen into a bright red berry which has a bitter sweet taste. They are ready for harvest every year between September and November. Food from the bogs includes Heather honey with its delicious sweet taste and blueberries or frochans collected in the summer are a fantastic addition to any fruit salad. Other beneficial uses of bogs include controlling flooding, as naturally bogs store water. They can be called carbon stores as they are made up of dead plant material that is undecomposed. They are a habitat for a selection of Irish wildlife including heather which is known as lucky charm, bog cotton that was once spun to make cotton for making clothes and sphagnum moss was used as a wound dressing during World War I. This entry was posted in News and tagged Activities, Bogs, Conservation, Food, IPCC, Things to Do. Bookmark the permalink.